Heheheh.. thanks Te Kat.. ganahan pod diay ka's bougainvillea.. that's great! cheers! muahhh! bakit un available to comment daw? sa site mo, do-follow sya, pero while I type this comment, no follow naman sya... waah!!! what a beautiful cascade of flowers! Great red! I do see the red car. Happy Birthday! agoy pagka puwa kaau sa bougainvillea nimo madam sis...wala uroy ko kaau ka kita ana dire...sa pinas bisan unsa pa color...ehehehe! 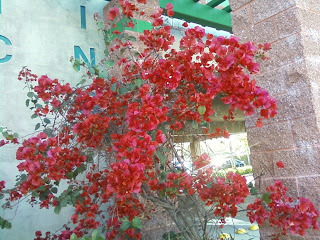 I've never seen bougainvilleas for such a long time now.We used to have them in our garden at our old house in Davao. We have a lovely garden then---roses, jasmine, orchids, daisies, gladiola, santan, gumamela ,sunflower, and tulips. Mama nako mahilig mag-garden. @ sis Anne, heheh.. ihi^ jud.. ;-) but yeah that's effective jud daw in most of the plants for its flowers to bloom. Thanks for sharing your thought sis.. muahhh! hi cai karon ra ko purteng bisiha, salamt sa laag ... ruby jud imong flower .. lovely..
We have lots of that here pero I rarely see red bougainvillea. 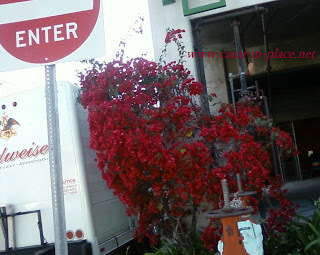 we too have many bougainvillea sa pinas... pretty pics you got! I love Bouganvilla's!!! Glad I could help out with the wrod Hibiscus!!! Thanks for visiting my blog!! Have a great weekend! Grabe ka busy sa pagpangodak nimu karya. daghan bya na sa atoa sa, diri ky wa kaayo ko kita mn. very nice flowers Cai..love it! can't find these flowers in our place..only in the philippines lang Cai..thanks for the visit..feel free to visit my travel blogs! amping diha!